(CNN) With summer near, beach hotels are on our mind. Well, they always are, but especially now. A spate of new coastal hotels are opening in time for this weekend’s Memorial Day holiday — the unofficial launch of summer in the United States. Formerly the Four Seasons Manele Bay, this transformed luxury hideaway — owned by tech billionaire Larry Ellison — re-opened in February with 217 rooms and suites. There’s plenty to try out, including new dining venues such as Nobu and One Forty for steaks and Hawaiian seafood, a Jack Nicklaus-designed golf course now exclusively available to hotel guests and island activities including scuba diving, horseback riding and UTV tours. Scheduled to open Memorial Day weekend, the latest from Meritage Collection is about blending modern, beachy features with unfussy service. Expect to see the concierge playing the ukulele in the lobby as you’re taken to a cabana for check-in. Or be taken on a pedicab tour of Huntington Beach Pier before meeting with the hotel’s surf butler. Other amenities include a Balinese-inspired spa, yoga classes and two infinity-edged pools. Almost all 250 rooms and suites look out to the Pacific Ocean, so the water’s always within sight. This boutique hotel, which opened on May 15th, is all about bright, look-at-me aesthetics. Guest rooms are a mix-and-match of abstract wallpapers, sculptural metallic chandeliers, patterned textiles, reclaimed wood furniture and exotic area rugs. The Lark Suite has two balconies with great views of the Edgartown harbor. Combining classic mid-century design with art deco flourishes, this 363-room hotel — part of Hyatt’s newly launched Unbound Collection — is located right on the beach. It also gives guests reasons not to leave: an open-air, rooftop spa with yoga classes, all-girl DJ parties and an after-hours happy hour at celebrity chef Dale Talde’s TALDE Miami Beach. 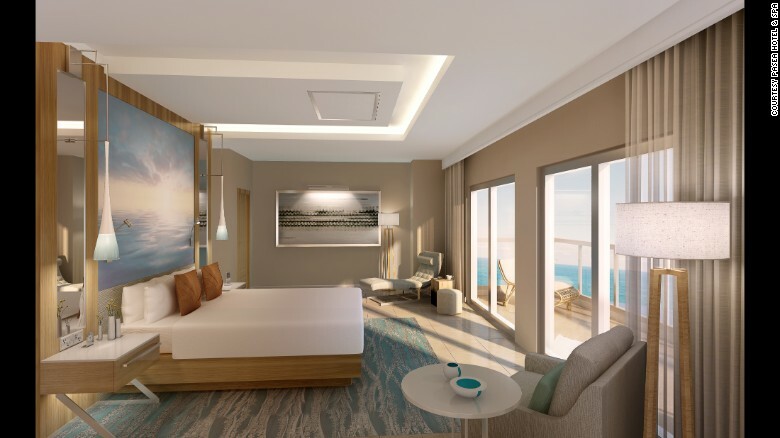 “There’s never a guest concern about what their view will be or a doubt that it will be phenomenal and exactly what they want to see on a beach vacation — the sand and sea,” says general manager Jeff Castner. The new Opal Sands Resort is a one-stop shop for sun worshipers: the sea is right outside the doors, there’s a beachfront pool with a hot tub and the resort has four dining venues, including a beachside tiki bar. Previously a carriage house, this months-old bed and breakfast in trendy North Fork is about a mile from the beach. But its location around the corner from the harbor makes ferry jaunts to nearby Shelter Island easy. The interior’s simple design is topped with plenty of nautical flourishes, including rope details in the restaurant, anchor paraphernalia on the walls and stripes everywhere. It’s modern beach chic at its finest. It’s an intimate setting with only five suites, but the seasonal restaurant downstairs is a popular hangout for locals and visitors. Guests of the B&B get priority reservations. Chadner Navarro is a New York-based freelancer writer.